How to Copy Protected DVD to Hard Drive Without Video Quality Loss? In this winter holiday, are you going for a long trip but still worry about how to spend the boring time? Do you have no idea about how to deal with the DVD collections to keep them safe from the kids to be scratched? Or your DVD player stop working because of freezing weather? To copy your DVD to hard drive and watch DVD backups on PC is what you really need to do. However, problems come up again? What DVD software I should use to keep the converted video working as the original? How can I copy DVD to hard drive since most of them are well protected? How long will it take to copy DVD to hard drive? And so on. How to Free Rip/Copy DVD to Hard Drive? WinX DVD Ripper Platinum/for Mac - Copy DVD to Hard Drive within 5 mins while keeping 100% original video/audio/subtitles! Nothing need to be worried now. You can use WinX DVD Ripper Platinum (click here to get Mac version ripper) to make perfect 1:1 DVD copy to hard drive and store as MPEG2 video formats, which is compatible with all general media player software, even playback on Windows Media Player. It enables you to decrypt & copy DVD to PC with 100% original video, audio and subtitles within only 5 minutes. Its incredible fast ripping speed makes you save time to do other meaning things. The converted video is exactly the same with the originals without any quality loss. Besides the ability of copying DVD to hard drive as MPEG2 video formats, it is also the best solution to rip DVD to other video formats, like DVD to WMV, DVD to AVI, DVD to MP4, FLV, 3GP, MOV as well as convert DVD to portable devices, iPhone, iPad, iPod, PSP, mobile phone (3GP), Microsoft devices, Android mobiles, etc. Most important is that, it not only supports Protected & Commercial DVD, CSS protected DVDs, all region 1-6 DVDs and commercial DVDs. it also lets you backup new generation protected DVD. With this software, you can copy your favorite DVD movies, like UP, Frozen, Avengers: Infinity War, Jurassic World: Fallen Kingdom, Coco, Deadpool 2, The Hunger Games, and so on easily and quickly. Why hesitate? 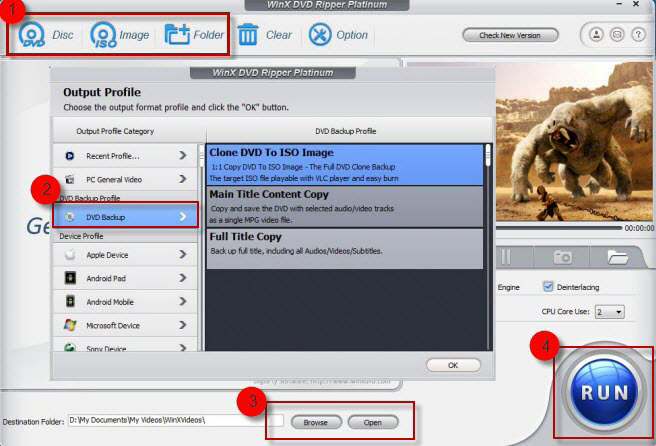 Download WinX DVD Ripper Platinum or WinX DVD Ripper for Mac to try now. Step 1: Download and run WinX DVD Ripper Platinum, then import the DVD by clicking "DVD Disc". If you would like to load from existing ISO image or DVD folder, then click the "ISO Image" or "Folder" button next to the "DVD Disc" button. Step 2: Select the output format. If you just want to make a copy of the DVD without any quality loss, then select "DVD Backup" button. Step 3: Choose Output Folder. Select where you want to store the converted video by clicking "Browse" button in output setting area. Step 4: Start Ripping. Click "RUN" button to start ripping DVD. 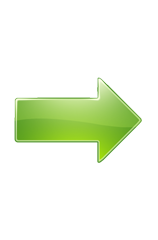 During the conversion, you can view the conversion progress and are able to cancel the converting process at anytime. From above, it is easy to find that to copy DVD movies to hard drive with WinX DVD Ripper Platinum is a simple task. Little time will be needed for all the process. You can download this DVD ripper software to take a try now. WinX DVD Ripper Platinum: Advanced version of free WinX DVD Ripper. Besides converting DVD to AVI at fastest speed in excellent quality, also converting DVD to MP4, MPEG, MOV, WMV, FLV, M2TS, TS, iPhone, iPod, iPad, Android, Samsung, HTC, Microsoft, Google, Sony, Nokia, Asus, Acer, etc. Makes perfect 1:1 DVD to ISO image/DVD folder copy and clone DVD to multi-track MPEG2 file with 5 minutes only. Constantly update to defeat upcoming DVD copy protections. Digiarty Software does not advocate ripping copy-protected DVDs for any commercial purpose and suggests referring to the DVD copyright laws in your countries before doing so. [Solved] How to Free Rip DVD with Same Quality on Windows (10)?